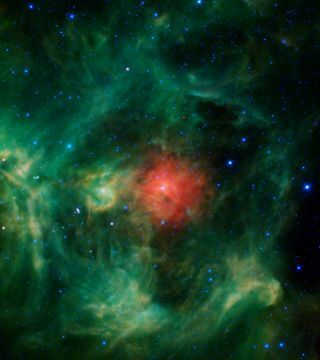 In this image, captured by NASA's WISE space telescope, the star-forming nebula Barnard 3 looks like a Christmas wreath. Baby stars are being born throughout the dusty region, while the "silver bell" stars are located both in front of, and behind, the nebula. The nebula is called Barnard 3, and it's found in the Perseus constellation. The star in the center of the red cloud, known as HD 278942, is so bright that it's lighting up most of the surrounding clouds. The red cloud is probably composed of dust that's cooler and more metallic than the material in surrounding regions, researchers said. WISE launched in December 2009 on a mission to survey the sky in infrared light. The telescope shut down in February of this year, after taking about 1.8 million images of cosmic objects and discovering more than 33,000 new asteroids. Researchers are still sifting through the huge amounts of data WISE collected during its observational life. Saturn's third-largest moon Dione can be seen through the haze of its largest moon, Titan, in this view of the two posing before the planet and its rings from NASA's Cassini spacecraft released on Dec. 22, 2011. The north polar hood can be seen on Titan appearing as a detached layer at the top of the moon here. NASA's Saturn-studying Cassini probe has also delivered a photographic holiday package. Two newly released Cassini images show three of Saturn's frigid moons hanging in space like gaudy cosmic ornaments, girded by the massive planet's magnificent rings. Saturn's moon Tethys peeps out from behind the larger, hazy, colorful Titan in this Cassini view of the two moons. The natural-color photos depict Titan, Saturn's largest satellite. In each of them, a second, icy moon — Dione in one case, Tethys in the other — is visible in the distance behind the haze-enshrouded Titan. While Earth's northern hemisphere is just now shifting into winter, it's currently northern spring in the Saturn system and will remain so for several years. Northern summer is due to arrive in 2017, and Cassini should be around to see the seasons change. NASA has extended the mission of the spacecraft, which launched in 1997 and arrived at Saturn in 2004, through 2017. "As another year traveling this magnificent sector of our solar system draws to a close, all of us on Cassini wish all of you a very happy and peaceful holiday season," Carolyn Porco, Cassini imaging team lead at the Space Science Institute in Boulder, Colo., said in a statement.